For as easy as Android can make your life, the simple task of getting photos, video and music from your computer to your phone isn't quite as straightforward as it should be. We're going to put an end to that right now. After the break: How to get your storage card to show up on your computer. No rooting. No extra programs. Just a few simple steps. Let's get right to it. 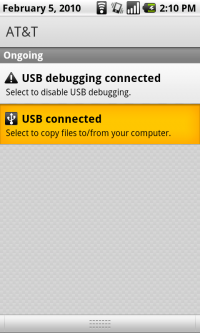 Using the cable that came with your phone, plug one end into your phone, and the other into an available USB port on your computer. If it's your first time connecting, Windows should automatically download a driver. With that out of the way, you're just a couple of taps away on your phone from bringing this one home. 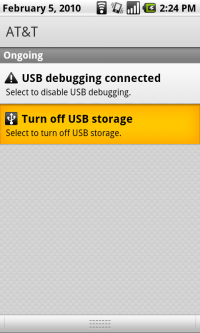 On your device, pull down your notification bar and tap on USB connected. 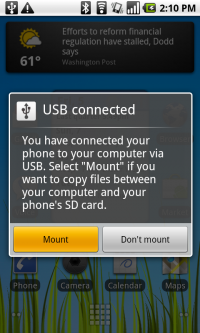 You'll then be asked if you want to "Mount" your SD card and copy files between your phone and computer. Choose "Mount." That's it. Your storage card should now appear as one of your options under "My computer" or however else you're used to navigating through Windows. In the example below, the storage card shows up as the "F" drive. You can now freely copy files to and from your storage card. DON'T SKIP THIS STEP: When you're done, you going to be tempted to yank the cable. But let's do things the right way. It's important to make sure you don't mess up any of your files. First you'll need to unmount or eject the storage card from your computer. 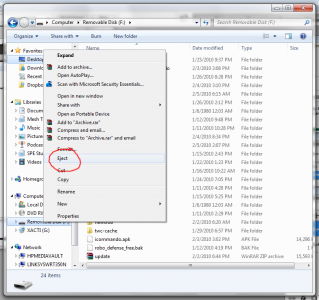 In Windows 7, find it in your list of drives, right-click and choose "Eject." Then go back to your phone. 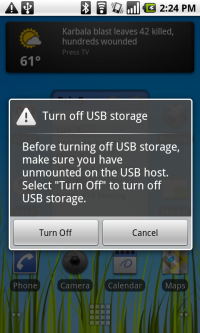 Pull down the notifications bar again, and choose "Turn off USB storage." You'll get a warning telling you to make sure you've "unmounted on the USB host," which you just did by ejecting it from your computer. So, choose "Turn off," and we're done. For you Mac folks (and let's face it, this is probably old hat to you), just remember to properly unmount the storage card before you turn off USB storage on your phone. Otherwise, everything's largely the same.